The short answer: If you want to increase the water holding capacity of your potting mix, adding vermiculite is preferable. Perlite is good for improving drainage when it’s used in the right amount (at least 1/3 of the finished mix). Although both perlite and vermiculite work to improve water-retention in dry potting soil, vermiculite is the superior option (assuming that drainage is taken care of). When either perlite or vermiculite are used exclusively, vermiculite is better for germinating seeds and perlite is better for establishing cuttings. As the sole growing medium in a hydroponic setting, perlite is more suitable, although a mixture of the two is ideal. Vermiculite is good as a seed starting mix and preferable to many other media. There is a lot of confusion surrounding the “perlite or vermiculite” debate. This is partly because commercial companies advertise both materials for the same uses and partly down to the the fact that they do actually fulfil many of the same functions. In this post I want to have a look at what the distinctions between the two materials actually are. I’ll also explore how they are best used in different situations. Hopefully I’ll be able to put to bed some of the misconceptions that go hand-in-hand with the two growing media. Disclaimer: The information for this post comes from my own research and experience using both perlite and vermiculite as a container grower. If any scientifically-minded gardeners want to pick me up on some of the finer points, they are most welcome to (I would, in fact, really appreciate it so I can make any corrections). The word “perlite” has two meanings. In the strictest sense it refers to a type of glassy volcanic rock (the product of “rapidly cooling magma“) that’s found in various places around the world, particularly Greece, the United States and China. 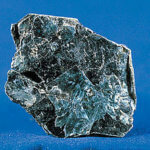 When it’s crushed and heated it rapidly expands to up to 20 times its original size. During this process it also softens and takes on the honeycomb texture that you’ll likely be familiar with. So “perlite” in the gardening sense (the correct term is “horticultural perlite”) is really “expanded perlite”. This expansion is made possible by the presence of around 6% water in the crude rock (see the picture on the right). 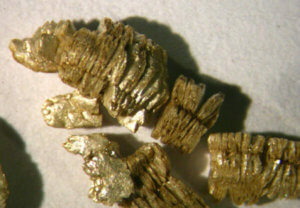 Vermiculite in its natural form. Like perlite, vermiculite is a type of rock – or, rather, a mineral (rocks are aggregates of two or more minerals). Its layered structure is such that the heating process turns flakes of ore into a highly porous material, which is usually around 96% of its original volume. Vermiculite is very lightweight and has a high water-holding capacity. Container and hydroponic growers also like it because of its high cation exchange capacity (CEC). CEC is a measure of a growing medium’s ability to “hold on” to nutrients, keeping them available for later use by plants. 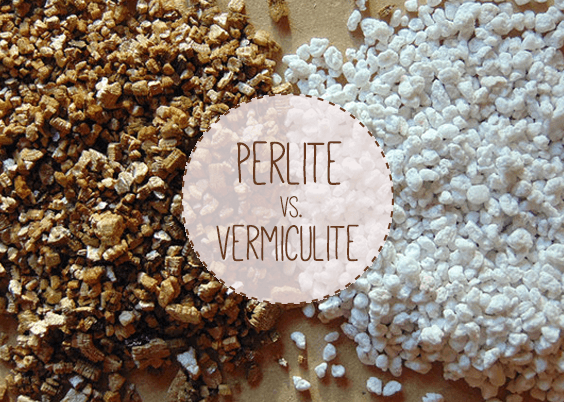 What’s the difference between vermiculite and perlite? The best way to understand the differences between perlite and vermiculite is to have a look at their unique particle structures. Each particle of perlite is comprised of tiny closed air cells or bubbles. The surface of each particle is covered with tiny cavities which provide an extremely large surface area. These surface cavities trap moisture and make it available to plant roots. In addition, because of the physical shape of each particle of perlite, air passages are formed in the growing media thereby providing excellent aeration. Vermiculite is a key ingredient in Mel’s Mix, which also works well as a potting mix. Perlite doesn’t actually have any air-holding capacity in and of itself. If you look at single particle of perlite under a microscope, you’ll see that the air bubbles are contained within the walls of its sphere and are inaccessible to plant roots (this is why perlite floats). The reason perlite is said to increase drainage is because when you put enough of it together it creates a mix with lots of macropores (spaces big enough for water to drain through). Water is held in the small cavities and crevices on the surface of individual particles, not inside them. Whilst vermiculite will provide drainage to a degree, perlite is coarser and better maintains its structure, so the macroporosity of the perlite mix is greater. But that’s the point – the perlite particles need to be touching each other to produce the intended result. If you add a small amount of perlite to soil or a potting mix, what you end up with is lots of small granules surrounded by compacted mix, with no discernable improvement in drainage. Another point worth mentioning, following from what I’ve said above, is that perlite doesn’t work to improve drainage in small quantities as well as other amendments like sand and composted bark (which is probably one of the best things you can add to your mix to increase aeration). Vermiculite is the geological name given to a group of hydrated laminar minerals which are aluminum-iron magnesium silicates which have the appearance of mica, and is found in various parts of the world. When processed for horticultural use, the mineral is subjected to intense heat, expanding it into accordion-shaped granules with countless layers of thin plates. Both naturally-occurring and horticultural vermiculite have a “laminar”structure. This means that they are composed of innumerable layers. When vermiculite rock is heated these layers separate somewhat. This is where the expanded material’s exceptional water-holding ability comes from. A particle of vermiculite is essentially like a little sponge, made up of lots of little layers, the space between which water is able to enter. Perlite is better than vermiculite at improving aeration or “air porosity”. Including perlite will create a mix that has more “macroporosity” than vermiculite when it is used in quantity, in excess of 1/3 of the total mix. This means that the spaces between perlite particles are big enough to allow water to drain through them whilst also allowing for water-retention and the effects of capillary action in small surface crevices. Vermiculite is a better water-holder. Vermiculite is more sponge-like and has a higher water holding capacity (WHC) than perlite. If you were to put a handful each of vermiculite and perlite into two separate pots and water them so that they both became fully saturated, the perlite would dry out faster than the vermiculite. Remember that perlite particles can only hold moisture in the small bubbles on their surface. Because of its higher “microporosity ” vermiculite is a better option if you’re looking to increase moisture whereas perlite will improve both water-retention (in very dry soils) and drainage. If you’re in a climate or environment where your soil or potting mix dries out quickly, then keeping as much water in your pots will be a key concern. In this case, vermiculite is preferable. The rate of evaporation from perlite is also higher. 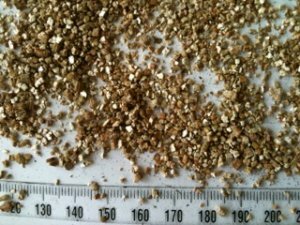 Vermiculite has a high cation exchange capacity (CEC) whereas perlite has almost none. In a hydroponic setting, where perlite is used as the sole growing medium, it will be necessary to apply feed more regularly than if vermiculite, which is able to “secure” nutrients for a longer period of time, is used. 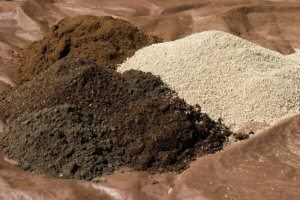 For seed germination, where near-permanent moisture is required, vermiculite is ideal. Seeds germinate and grow much better in moist environments (consider that seeds for sprouting need to be kept permanently moist) and for this reason vermiculite is a good medium for germination. The fact that a seedling mix composed of vermiculite doesn’t contain any nutrients will encourage germinating seeds to send out stronger, wider-ranging roots (commercial mixes for germination tend to be low in nutrients for this very reason). 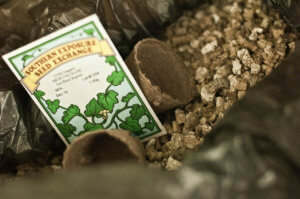 You can use vermiculite on its own or combine it with some potting soil. Perlite is better for cuttings due to to its high macroporosity. Cuttings tend to benefit from having access to lots of oxygen as well as water (many experts will advise sand or grit as a 50% component of potting mixes for cuttings to increase drainage). Both have a neutral pH. Both have a neutral pH and therefore are suitable for use with most kinds of plants. At the risk of adding another layer of complexity to the discussion, it’s also important to mention grades. Both perlite and vermiculite are sold in three different grades: fine, medium and coarse. The coarser the material, the higher the air-holding capacity and the lower the water-holding capacity, as measured using a pure mix. As grades become finer, the inverse is true. This means that if you want to use vermiculite for improving your mix’s water-holding capacity but are also concerned about drainage, opt for the coarsest grade that you can get. The different grades of perlite and vermiculite refer to the spectrum of sizes into which particles of a particular grade will fall. So, for example, a bag of fine perlite (as shown below) will contain particles that are between 0.5 and 2.00 mm in diameter. It is possible to buy further graduations of the sizes listed (such as super-fine or super-coarse), but I haven’t bothered with those. Here’s a quick rundown…. How do you measure these things anyway? Measuring the air and water holding capacity of growing media is a relatively simple process. As a container grower it’s worth knowing because it will improve your overall understanding of the materials you’re working with. After fully saturating a growing medium with water (which involves leaving it soaking in water for the required period of time) and allowing it to drain, portion of the”free space” in the mix will be occupied by water (this is the water-holding capacity) and a portion occupied by air (this is the “air space after drainage “or “free porosity“). As I mentioned, the process for measuring these spaces is relatively simple. As I’ve already said, enough water is added to the medium to completely saturate it, up to the soil line. The volume of water that is drained is then divided by the volume of space occupied by the saturated medium to calculate water-holding capacity as a percentage. Air-holding capacity is measured by subtracting the water-holding capacity (as a percentage) from the the total porosity (which is also a percentage and refers to the amount of space in the mix which both air and water can occupy). Are perlite and vermiculite safe? The short answer is yes. Finished perlite and vermiculite products, along with their associated mining and manufacturing processes, are closely monitored and have to adhere to the health standards of the relevant government bodies in the countries in which they are sold. There was talk about asbestos contamination of vermiculite, due to the proximity of some vermiculite mines to asbestos deposits, but this was in a period before 1990. Horticultural vermiculite can be assumed to be safe. As with any materials that contain dust, it’s always worth working with the them outside, to avoid throat and lung irritation. Conclusion: Vermiculite or perlite? Which one is it then? So there you have it! If you managed to get all the way through this article then congratulations. You should now have a fairly comprehensive understanding of the differences between these two growing media. As an addition to a potting mix: vermiculite for increasing water-holding capacity (WHC), perlite for improving drainage (air porosity). On their own: vermiculite for seeds, perlite for cuttings. For growing hydroponically, or as the sole medium: perlite is the better of the two but a mix of both is ideal! And on that note I’m just about ready to collapse into bed! This was a real mammoth to write. Please do get in touch and let me know what you think! I’m always eager to hear what others think and whether or not they agree. Happy gardening! Image Credits: Seed starting by MyNeChimKi; Mel’s Mix by Wally Hartshorn; Vermiculite by Brian Edgar. Wow, what a great comparison and contrast of vermiculite and perlite. I use fine verm for seedlings and keep a close eye on watering. Perlite is good for my tomatoes because I want to water them well but not keep their feet wet. I have to agree, that was a great comparison! This came in handy as I’m currently experimenting with different ratios of vermiculite, perlite, and peat moss for propagating cuttings, seedlings and growing veggies too! Thank you!! Thanks Nani! Keep me updated on how it goes! Love this article. It was very clear and easy to understand. It was suggested we use perlite in our foundation beds….but didn’t get the whole story behind it. In calling around to purchase perlite it seemed to be fairly scarce, but could get vermiculite. Well, we have clay based “soil” and vermiculite would not work. We were able to find a country store with “course” perlite. After reading this article we decided to go with the course product. We need to amend the soil around our landscaping to help drainage and break up the soil that seems to have turned into clay. Thanks for your informative article. I am keeping for future reference…love the list of references at the bottom of the article! I spent many years in the landscaping business. We sold a lot of plants for growing in pots. Many clients wanted to use perlite very sparingly. I tried over and over again to get them to understand that too little perlite was pretty much a waste of money. I wish I would have had copies of this article back then. Your article clearly clarifies the entire subject. Every nurseryman, grower and gardener should have a copy of this great resource. You kept it short and yet covered every point that was important. Great job!!! Thanks for the kind words Ray! Really appreciate it. Excellent article! I finally understand the difference between the two. Thanks!